A comma marks a slight break between different parts of a sentence. When used properly, commas make the meaning of sentences clear by grouping and separating words, phrases, and clauses. Let’s slow down for a second here(or maybe more) and learn a few basics about the usage of the mighty comma. • “I will come around 6 pm,” said she. • “When will you come home?” she said. • “Did you complete the homework?” asked my teacher. A parenthetical expression is an expression which is inserted into the flow of thought of the speaker to show emotions. Ex- of course, for instance, in fact, however, etc. Question tags or tail questions को वाक्य के अंत में लिखा जाता है। यह ज़्यादातर informal nature के होते हैं जैसे की- isn’t it, doesn’t it, right, can’t you, won’t you, etc. 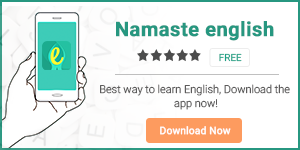 हिंदी के माध्यम से English सीखने के लिए download करें हमारी English learning app Namaste English. Countable and Uncountable Nouns: What are they?